I first heard about this story on the DC Hot-Line, the short-lived 800 number where, once a week, readers could call in to hear news about upcoming DC projects, at a cost of fifty cents per call. Like every other idiot in the world, I called faithfully every Monday, when the new messages would go live–rather than waiting until, say, Wednesday, when the number of calls would have been a lit easier to get through. Once connected, I’d strain to decipher the often badly-recorded messages–it wasn’t infrequent for me to make several calls in order to piece together the information. And that’s definitely where I heard somebody, possibly series editor Paul Levitz, talk about the “Atom’s Quest” serial. 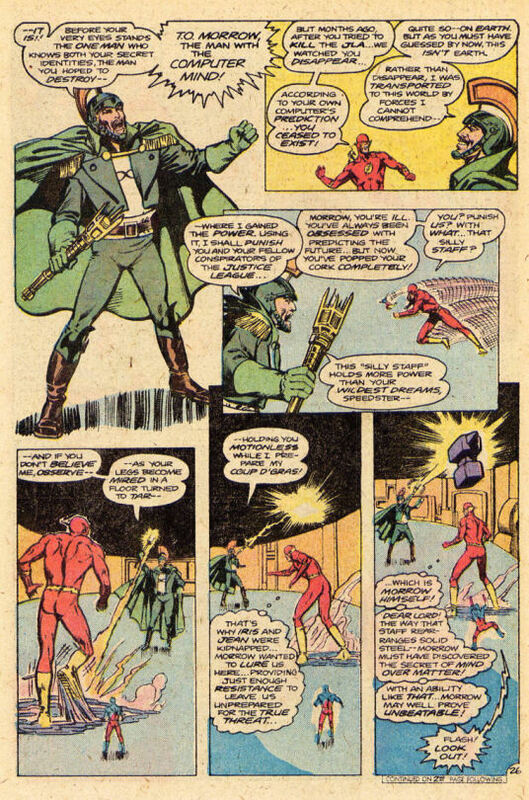 “Atom’s Quest” (never named that in the books themselves, but still how I think of it all these years later) ran through four issues of SUPER-TEAM FAMILY, as well as intersecting with another favorite title of mine, SECRET SOCIETY OF SUPER-VILLAINS. 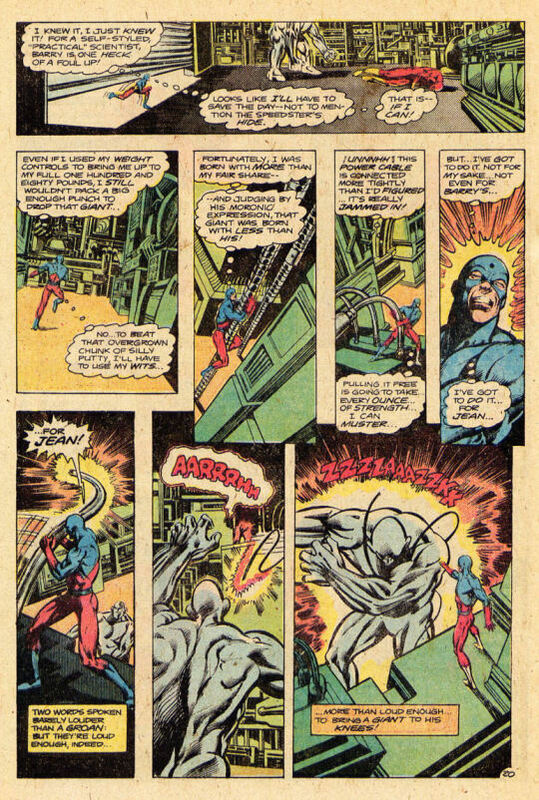 Te consistent element was the Atom himself, on a sojourn to locate his missing wife, and teaming up with pairs of other top DC heroes along the way (the Tiny Titan alone apparently not being enough to get readers to purchase the magazine.) 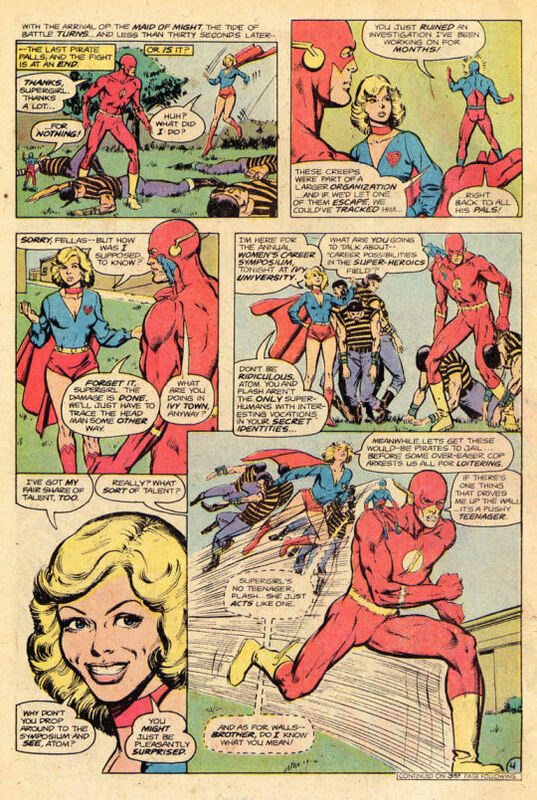 In this first installment, the Atom’s more popular co-stars were my all-time favorite, the Flash, and Supergirl. The artwork was especially noteworthy at the time, as it was a more modern representation of these characters than had been seen up to that point. It was executed by Alan Weiss, a popular artist who was meticulous enough in his work that he could never manage to hold down a regular series for long enough to really explode as a superstar. In particular, in this specific job, Weiss modernized the hair styles of all the female characters, giving Supergirl a then-current Farrah Fawcett haircut. He was inked by a young Joe Rubinstein. 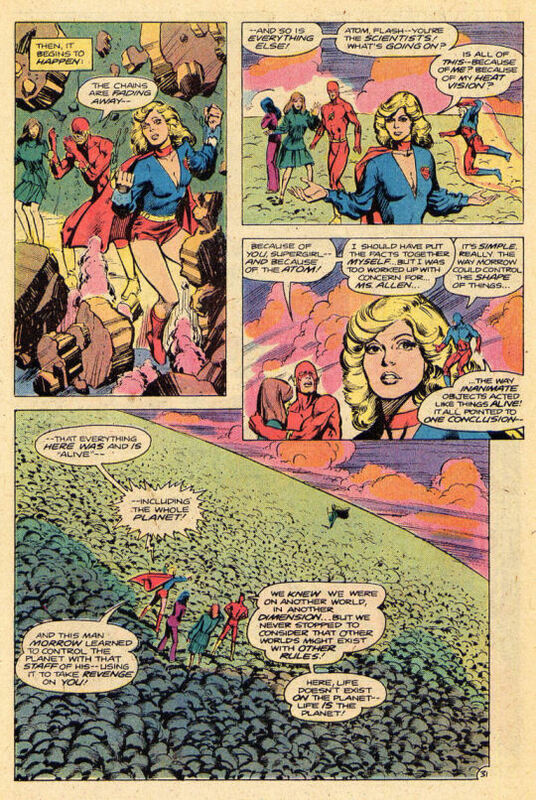 The story opens in the Atom’s home city of Ivy Town, with Supergirl appearing to assist Flash and the Atom in the defeat of a gang of would-be pirates who are raiding Ivy University. (This story indicates that Ivy Town is in Connecticut, rather than Massachusetts, which seems wrong somehow.) All three heroes are here for the Women’s Career Symposium–Supergirl for nebulous reasons as Linda Danvers, College Guidance Counselor, and Flash and Atom as the plus-ones of Iris Allen and Jean Loring, who are being honored as a journalist and a lawyer, respectively. All three women are introduced to the gathered crowd by a thinly-disguised version of new DC publisher Jenette Kahn. But instants later, all three women are seemingly disintegrated by a beam of energy from out of nowhere. 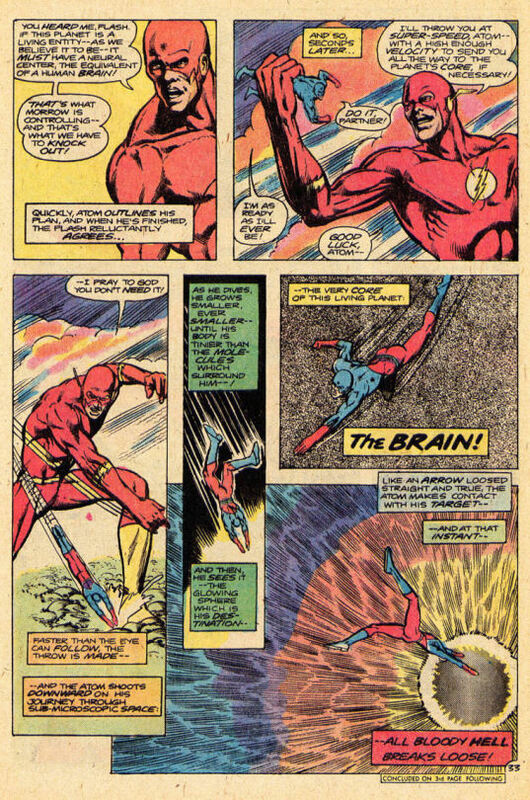 There’s some tension between Barry Allen and Ray Palmer as they examine the remains of their lady-loves–earlier, Barry had made an inelegant comment about being a practical scientist while Ray was only a theoretician, and that’s set off Palmer’s sense of self-doubt. The Atom shrinks down into the powdery remains of the three women, only to be attacked by a bunch of blue-skinned monsters. And up in the land of the full-size, the Flash is similarly accosted. The two heroes are able to overcome these obstacles, and they then rush off to the lab to analyze what they’ve found at the crime scene. Elsewhere, Linda Danvers wakes up to find herself, Iris and Jean not dead but rather imprisoned in a plastic tube. 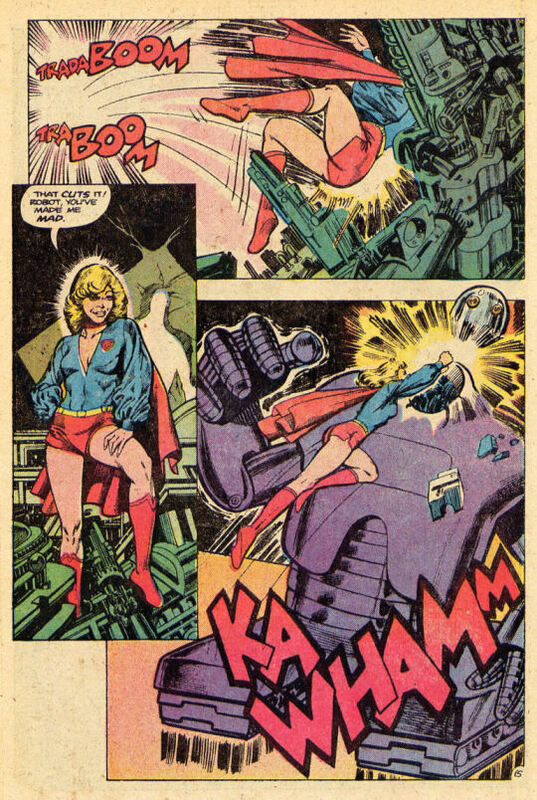 Becoming Supergirl, she bursts free of confinement, only to be accosted by a lumbering robot. But this beast is no match for her Kryptonian super-powers, and she smashes it to bits. Back on Earth, Flash and Atom have analyzed the energy trail created by the creatures they fought, and follow it back to a headquarters in Central City. After some B & E and another short bout with the critters, the Flash reasons that he can match their vibrational frequency, taking himself and the Atom to wherever they come from. In the meantime, Supergirl has freed Jean and Iris, and the three of them bull their way through the facility they’re imprisoned in–only for their bid for freedom to be foiled by the selfsame energy beam that brought them there in the first place. While that’s going on, Flash and Atom have made their way to the homeworld of the creatures, where they find the JLA’s old enemy T.O. Morrow waiting for them. Somehow, Morrow is not only still live, but he’s developed the power of mind over matter. 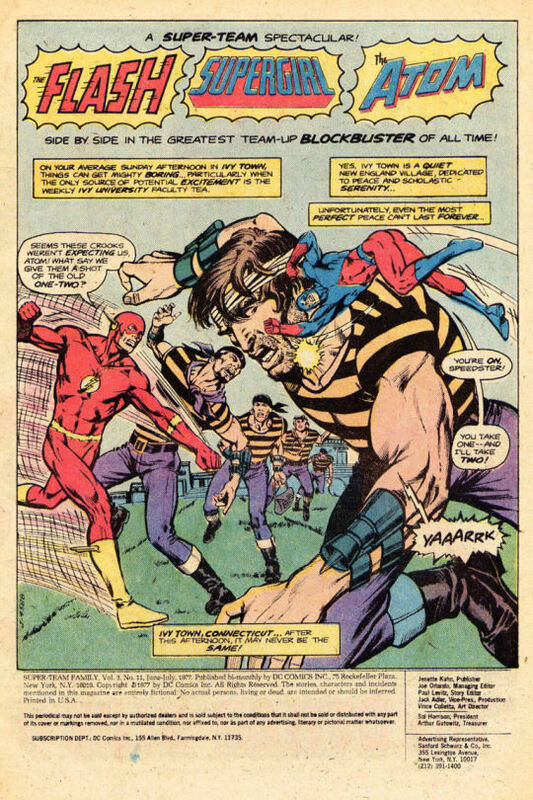 he captured Iris and jean to draw Flash and Atom to him (getting Supergirl in the bargain as an accident.) The duo puts up a good fight, but they too are clobbered. Everybody awakens in a dungeon cell together, where there’s a quick exchange of intel. What’s worrying is that, ever since she was brought to this world, Jean Loring has been acting oddly, almost catatonic. But none of the heroes can break free in order to assist her–not until the Atom works out that everything they’ve encountered so far has been made of the same strange material–the material of the planet itself. He instructs Supergirl to turn her heat vision on the ground, and as a result of the growing heat, the entire structure in which the heroes are imprisoned comes apart. 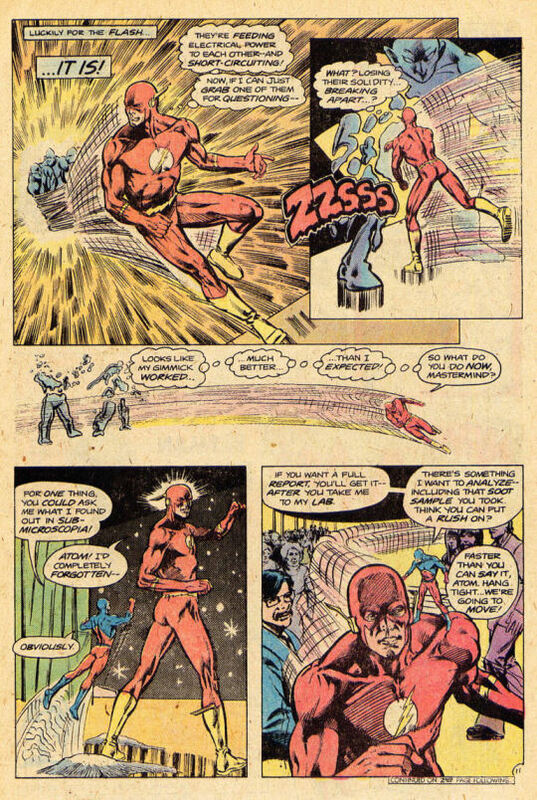 **ADDENDUM** Mark Waid informs me that it was Gerry Conway who gave the DC Hot-Line message teasing “Atom’s Quest” all those years ago, not Paul Levitz, and that the call to the hot-Line was a Toll-Free call.